General description : This 2000 Ferrari 360 Modena F1 2 Door Spyder (Stock # F13315) is available in our Fairfield, CA showroom and any inquiries may be directed to us at 707-419-8200 or by email at Sales@SpecialtySales.com. 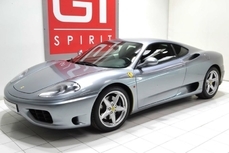 The next amazing classic up for grabs in our Fairfield showroom is this outstanding 2000 Ferrari 360 Modena F1 2 Door Spyder with very desirable Argento Nurburgring Silver exterior paint and a custom factory-ordered red and black leather interior. You’ll find a 3.6L, 400 HP V-8 engine under the hood with the F1 paddle shift transmission and this stunning supercar is fully loaded from top to bottom for sizzling performance. 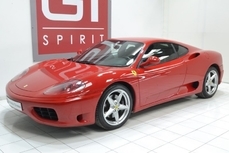 It has a mere 4,083 lifetime miles showing on the odometer as well and this Ferrari is in outstanding like-new condition throughout. The 2000 Ferrari 360 Modena F1 Spyder has been referred to by numerous experts over the years as the purest sports car in the world today. That’s because it does everything well; the acceleration is deceptively fast and the F1 paddle shift makes this beautiful supercar feel track ready at a moment’s notice. The handling is what normally stands out in collector’s minds because no vehicle in the world glides through tight curves better- not even this one’s Testarossa big brother from the 90’s. 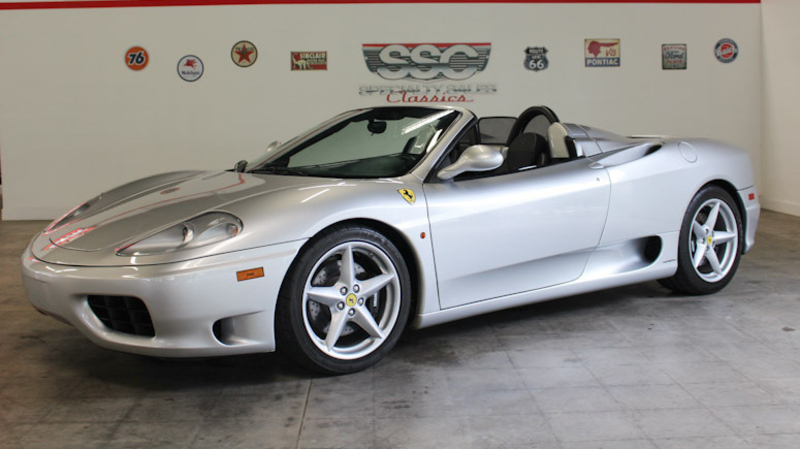 The current owner of this this 2000 Ferrari 360 Modena F1 Spyder informs us that this supercar originally sold in Puerto Rico and was brought to the continental US several years later by the 2nd owner. 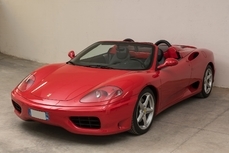 Additionally, this 2000 Ferrari 360 Modena F1 Spyder underwent its scheduled 30k factory maintenance check back in March 2016 and this supercar has only been driven about 300 miles since that time. This Modena has its original tool kit and factory manuals as well. It also received new tires around the same time its maintenance check was performed and the power Spider top was also serviced in 2017. On a closer inspection, we found this example to be in excellent overall condition with no real signs of wear- all rubber is still supple and we couldn’t find any material shrinkage on the dash or the interior. This is a stunning performance vehicle that’s ready to be enjoyed today. Overall, this 2000 Ferrari 360 Modena F1 Spyder is a like-new supercar that has been lovingly cared for over the past two decades. It would be almost impossible to find a more impressive low-mileage, highly documented example anywhere near the current asking price, so do not expect for this amazing sports car to remain available for long. For more information about this vehicle, visit our Fairfield, California showroom, give us a call at 707-419-8200, or email us at Sales@SpecialtySales.com. Be sure to mention Stock # F13315 as well. 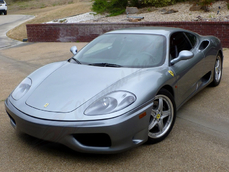 2000 Ferrari 360 8 cylinders 3.6 is listed for sale on ClassicDigest in Fairfield by Specialty Sales Classics for $89990. 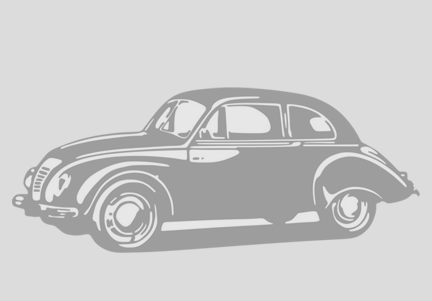 The first Ferrari road car was the 125 S introduced in 1947 and powered by a 1.5 L V12 engine, right? Well it's not quite that simple, Ferrari did in fact produce e Tipo 815, in 1940. Tipo 815 was designed by ex-Alfa Romeo engineers Alberto Massimino and Vittorio Bellentani and by Enrico Nardi under Enzo's company but legal issues with the former associate Alfa Romeo prevented Ferrari from launching the Ferrari marque at that point. Enzo did produce a series of fine road cars in the 50's and 60's but they were merely to finance his true passion racing, wheather GT/Sports car or Grand Prix. The 50's saw the birth of Ferrari's most memorable cars, 250 GTB (tour de France) 250 Testa Rossa, 250 GT swb just to name a few. Under the surface tension was growing though. In November 1961 long-time sales manager Girolamo Gardini made an ultimatum to Enzo: if tensions continued, he would leave the company. As a result, Gardini was ousted, as well as Scuderia Ferrari manager Romolo Tavoni, chief engineer Carlo Chiti, experimental sports car development chief Giotto Bizzarrini, and a number of others who stood by them. Without Chiti and Bizzarrini the development of what was to become the most quintessential Ferrari and today the world's most expensive car, 250 GTO, was at a pivoting point. 250 GTO project was saved by a young engineer Mauro Forghieri and long-time racing bodyman Sergio Scaglietti who stepped in and took over the program with known results. By the late 60's Ferrari's prototypes' success came to a sudden halt by a new competitor, GT40. Ford turned to Lola to produce a Ferrari beating long distance racer after Enzo had cut the deal off with Henry Ford II making the latter absolutely boil with fury. The collaboration between Ford and Lola created the mighty Ford GT40 that gave Ferrari some heavy hits in Le Mans 24 to come. By the end of the 60's FIAT purchased 50% of the company, starting a development that has led to a new mass-produced era of Ferraris. 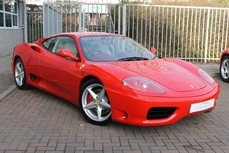 Whether you are selling or looking for a classic Ferrari www.classicdigest.com is the place to check out.